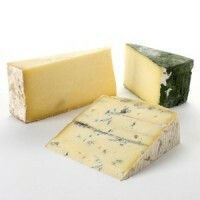 A balanced collection of artisan cheeses from the lush, productive pastures of Englands West Country. A selection of cheeses from one of the lushest areas in England. Cornish Yarg 250g - a firm textured, lightly pressed cheese, made in Cornwall to a Caerphilly style recipe and wrapped in wild nettle leaves. This attractive appearance is matched by a pleasant delicate flavour with a lactic nutty creaminess. Westcombe Cheddar 250g - a PDO West Country Farmhouse Cheddar made in Somerset by Tom Calver at Westcombe Dairy and matured for up to 20 months. A deep complex flavour with a mellow lactic tang and long notes of citrus, hazelnut and caramel. Cornish Blue 250g - a mild and creamy blue cheese made near Liskeard in Cornwall, based on a Gorgonzola recipe. This blue cheese is sweet and gentle, with a lovely creamy flavour.